Randy Schultz was just looking for a job. He ended up finding the love of his life. Respected members of the WNY media, the Schultz’s have carved out their niche in the hockey community. 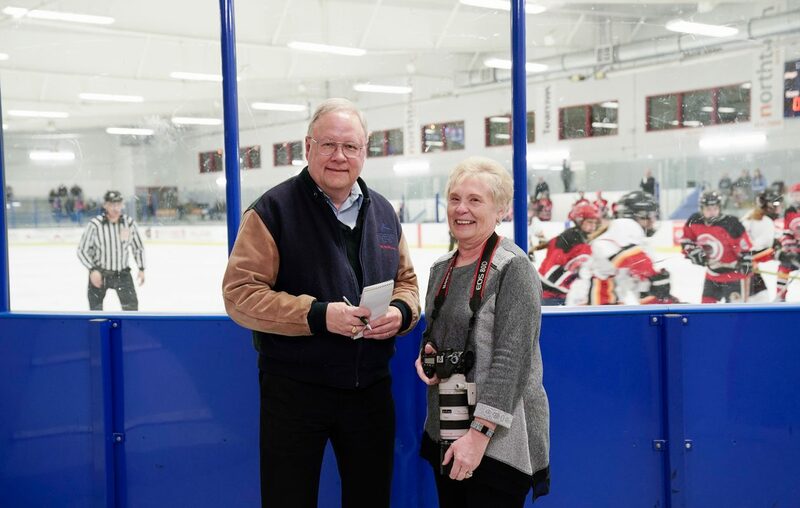 A perfect partnership that currently runs NYHockeyOnline.com, Randy pens the stories and Janet takes the photos. But it was their day jobs at Niagara County Community College that first brought them together. In 1978, Janet was on the selection committee to fill a job opening that Randy applied for. Interestingly enough, both Randy and Janet said it wasn’t a case of instant fireworks. It was better than that: it was friendship. Janet was going through an emotionally draining divorce. Already hanging out in the same group of co-workers, Randy offered a shoulder to lean on. Offering a sympathetic ear without an ulterior motive was enough to make Janet smile and view Randy as more than a friend. When she saw how her three-year-old daughter Karla and Randy connected, Janet knew it was meant to be. Randy said that as he and Janet got deeper into their relationship, he encountered the predictable “you’re getting an instant family” warnings from friends. But Randy said he could not have asked for anything more. Daughter Karla is now 42, and Janet and Randy have been married for 36 years. The Knights are also connected by their day jobs and their “moonlighting” work. Both employed by the Ken-Ton School District, Tim is a history teacher at Kenmore West High School. Debbie works in transportation. For the last three years, the duo has also fronted a popular rock band called The Knight Crew. Though Tim and Deb grew up on the same street, and their siblings were friends, they barely knew each other. They both attended Kenmore East High School, but Deb said the only conversation they officially had during their teens came one day at the Knights’ home. Tim was blasting AC/DC’s “You Shook Me All Night Long” on the radio. They briefly spoke about their mutual love of the song. Then that was it. Or so they thought. Tim and Debbie did not officially get together until they were in their mid-20s. Debbie had returned home from Georgia in 1992. Recently divorced and with two kids, she began working at the Knights’ pizzeria. Tim, who confessed he had been smitten with Deb since her visit home a year earlier, boldly asked Deb if she ever wanted to get married again. Deb asked why? Tim told her he wanted to marry her and help raise her two kids. Twenty-four years later, they’re still going strong. Partners in Hickling Images Photography, Margaret and Dan Hickling have a Hollywood love story that began as high school sweethearts. Even though they parted under painful circumstances at age 16, they never left each others’ hearts. Dan pursued a career in sports journalism, while Margaret followed her calling and became a teacher. Along the way Dan married twice, and Margaret once. The couple believes they were destined to meet again. In December 2008, Margaret was diagnosed with liver disease. The following April, she received a life-saving transplant. Reconnecting in February of 2012 through a mutual friend’s Facebook page, Margaret said she reached out to Dan with only one purpose in mind: to apologize for what happened in the past. Six years later, they married. As Dan and Margaret stood facing each other, singing along to the Ed Sheeran song “Perfect,” you could sense that true love has no expiration date: that it’s never too late to find, or refind, the right one.